The interpretation of works composed by the students of W. Rihm’s composition class. Concerts in collaboration with well known soloists of the contemporary music scene. 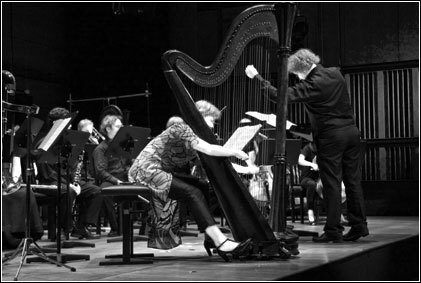 Interpretation of the contemporary ensemble and chamber music repertoire. Productions in collaboration with other structures (for example the ballet of the Staatstheater Karlsruhe, the ZKM). Russudan Meperiani, Stefan Pohlit, Vikintas Baltakas, Pey yu Shih, Vito Zurav, Birke Bertelsmeier, Euin Hongs, Heera Kim, Matthias Ockert, Naomi Pinnock, Marton Illes, Anna Kesselmann, Patrick Sutardjo, Damon Lee, Nara Shin, Stephen Beville, Eui-Hong Park. H. Lachenmann, K. Stockhausen, A. Jolivet, G. Benjamin, J. Rebotier, H. Goebbels, V. Carinola, W. Erbacher, Ph. Manoury, P. Boulez, Y. Maresz, Y. Kurtag, I. Xenakis, G. Crumb, L. Bério, H. Holliger, A. Boucourechliev, G. Buquet, P. Dusapin, P. Eötvös, M. Kagel, I. Stravinsky, R. Campo, O. Schneller, W. Rihm, A. Schönberg, M. Reudenbach, S. Reich, P. Marcland, E. Carter, F. Donatoni, O. Messiaen, S. Sciarrino, M. Feldmann, V. Globokar, G, Grisey, M. Jarrel, B. Mantovani, K. Saariaho, G. Scelsi, Y. Taira, T. Takemitsu, E. Varèse, B.A. Zimmermann.